But this Memorial Day weekend, we don't blame you if you'd like to keep your space to yourself. Good thing we've discovered Stay at Lincoln, a guest house hip enough to be mistaken for your home. Less than a block from Lincoln Road, Stay is smack dab in the heart of the action with access to all of South Beach's many pleasures (bikinied and otherwise). 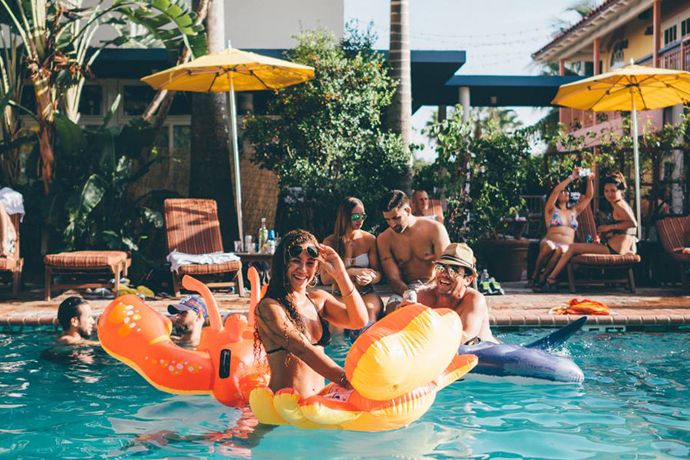 But for those times when you and your guests want a more domestic experience, you can kick back in the garden's brightly colored Adirondack loungers or take one of the bicycles for a cruise around Lummus Park. Styled in art deco, the renovated apartment building brims with vintage furniture and far-out artwork spread throughout nine uniquely appointed, compact but comfortable units. Which means you're likely to open the door to your guest house and find an antique sofa upholstered in black velvet, a hand-painted, surfboard-shaped coffee table or the rusty head of a decapitated carousel horse (think of it as Circus Mafia chic). Already a favorite of MTV execs and DJs in town for gigs, the spot also hosts weekly outdoor movie nights and the occasional back garden soiree. Which is a great way to get to know your guest neighbors.